Calling all curious minds from ages three to five! Sparklers Day Camp caters to our younger adventurers, providing them with a wide variety of fun indoor and outdoor activities. This summer our camp activities will be using literature to give kids opportunities to “Choose their own Adventures.” Each week your child will be introduced to different realms: nature, space, friendships, creatures big and small…oh the options are endless. Campers will fill their days with imaginary play, sensational science experiments, amazing art and maybe even a few animal encounters. Each week offers a different adventure; join us for another amazing summer of Sparkler Camp! Are you creative and enthusiastic? Do you have varied interests? Then the UCDS Summer Camp Series is for you! This collection of week-long, theme-focused camps for students entering first through sixth grades has something for everyone! To be eligible, students must be 6 years old on or before June 1st and be entering 1st grade in the fall. Some camps have age restrictions. Please check each camp description for details. For more information about UCDS Summer Camps, please email Director of After School Programs, Nicki Bowen. Come join Jenn and Kat for a week of celebrating the connections between art and nature! Inspired by the work of artists such as Richard Shilling and Andy Goldsworthy, we will spend time in and out of the classroom observing, collecting, and creating while inspired by the natural world around us. Through a variety of exciting art activities including making paper and collaging with natural objects, we will practice drawing techniques and explore texture, color, and shape. This is a week where campers can deepen their connection with the natural world through creativity and play. Get ready to paint “en plein air” – that means we will be outside! Join our quests in a land of myth and mystery, where stories come to life and you choose your own adventure. Campers will immerse themselves in fantastical and strange worlds as they embark on adventures and quests, all while in character as whimsical gnomes, learned wizards, or brave space explorers. We will learn the elements of creating characters and adopting their personas as they consider how their character, and not the camper themself, would handle any given situation. Buckle up. Let’s take a journey into the amazing world of all things active. This high-energy camp is a great way to discover new interests and hidden talents. So listen up sports fans, we’re going way beyond Hawks and Sounders! Each day, we’ll explore a new way to play. It could be Parkour or indoor rock climbing. Maybe it’ll be sports that kids play in other countries! This camp is all about energy, movement, and the sports we love. Join us for some memorable explorations into the wide world of sports. No experience required, so jump right in! Stronger! Faster! Higher! Come spend the week building an arsenal of training techniques for any and all sports, as well as the game of life. We will work on flexibility, core strength, and spatial awareness through partner drills, relays, and other activities. Campers will learn proper movement mechanics from a certified youth fitness trainer, which will help them become better athletes and set them up for a lifetime of fitness fun. Basic sports nutrition principles will be introduced with a daily post-workout smoothie bar! So much beauty in the deep blue sea! In this camp, we will use the ocean in all its splendor as our inspiration to create a collection of art projects. Campers will experiment with a variety of mediums—including but not limited to painting, drawing, and collage—to create whimsical and inspired masterpieces. Get creative with composition while learning the fundamentals of art and design! Get ready for an adventure learning the important skills of survival! Whether you’ve hiked to the summit of Mt. Rainier or you enjoy picnicking at your local park, this will be a week to remember with fun and challenges for everyone. We will explore activities such as shelter building, knot tying, foraging, and orienteering. We hope to see you for this week of expanding your comfort while outdoors and learning essential survival skills! You may have seen Seattle but have you ever tasted the city? Explore the history and culture of different Seattle neighborhoods through food! Whether we are talking with chefs, cooking something tasty ourselves, or exploring cultural art, we will fill our brains and our bodies with good food and knowledge! The week will be “peppered” with a variety of ways food weaves its way into our day. We will share family recipes, put on our chef hats, craft kitchen accessories, and trace the importance of a variety of foods in different cultures. If you delight in snacking, sharing, and discovering food, this is the camp for you! Do you like to repurpose, reuse, craft and build? Then this is the camp for you! Campers will spend the week inventing and designing creations made of recycled cardboard. Some days we will focus on engineering, some days on 2 and 3 dimensional art, and of course, we’ll have some time for free creation. Get ready to let your imagination run wild. Legos are on the loose! Spend a week building, experimenting, and programming with the Lego NXT, RCX, and the new EV3 Robotic Systems. Explore a wide variety of construction methods while building amusement park rides, vehicles of all sorts, simple machines, manufacturing systems, alternative energy sources, pneumatics, and of course, ROBOTS! Students new to Lego Robotics can learn the basics, while advanced builders and programmers can tackle the inventions of their dreams. In addition to our nearly one million sorted Lego pieces, we also have a library of the latest Lego idea books and access to countless online resources. Each morning and afternoon session will begin with a short instruction/discussion session followed by several hours of open-ended discovery and investigation. On the last day of camp, students will share their creations with family and friends. Learn the elusive ways of the ninja! Certified youth trainer Joseph Jones will guide campers to use stealth, silence and focus to solve puzzles, play agility-centered relay games and design their own obstacle courses. We’ll stock our secret stash with some carefully crafted ninja necessities and take a field trip to a local park to compete in a Ninja Warrior Obstacle Course Day. 3-2-1, BLAST OFF!!! Go for speed! Go for height! These acrobatic launches are sure to amaze even the most seasoned aeronaut. During this week-long exploration of all things rocket-related, we’ll make several launch-able creations. We’ll learn the ins, outs, and ups of basic model rocket building with some design techniques that are sure to send our creations moon-bound. And of course, we’ll learn how to safely launch our rockets. No experience necessary. Just bring a payload full of imagination! Chinese Cultural Exploration Camp is an exciting and stimulating introduction to the culture and language of China. While developing basic Mandarin skills, campers will be introduced to the traditional and contemporary aspects of Chinese culture that have drawn countless visitors to one of Asia’s most incredible countries. Wendy Tan is a native Mandarin speaker and also teaches after-school language classes at UCDS during the school year. This is the perfect summer for your child to widen their horizons and develop a love for a new language and an ancient culture! Where does the inspiration to dance come from? How can we tell a story through movement? In this exciting week, dancers of all levels will come together to learn different types of movements, such as ballet, tap, and even musical theater. Throughout the week, students will explore the history of dance and different ways to develop dance for personal expression. Using dance elements, music, props and collaboration students will create a variety of motifs. Each day will include warmups, improvisation and the opportunity to create our own dances using inspiration from all around us. Get out some energy, learn a little history, and create a band that collectively arranges a slamming rock n’ roll jam! Are you ready to join a rock and roll band? Come ready to rock out creating a real band with a real song. You will get to play on a variety of instruments—guitar, keyboard, drums, bass and perhaps vocals. We’ll crush the elements of songwriting, melody, harmony, rhythm, and structure. This will be a high energy camp and the volume will be turned to 11. No experience necessary! Campers will bring gadgets to life with electrical engineering and hardware code! We will be using Ardiuno microcontrollers to learn how to control inputs including buttons, light sensors, motion sensors, and sound sensors, as well as outputs, such as motors, LEDs, speakers, and more. Campers will learn how to use programming to control devices connected to the Ardiunos and leave with an understanding of how engineering and programming work together to make new and exciting inventions a reality. Take some time to unwind at Chill n’ Create with Kylie Booher. We will be creating a new piece of art each day while enjoying some relaxing tunes and flavorful juices. Canvas paintings, ceramic dishes, and figurines will come to life with color and careful guidance! A fun time and a great way to enjoy the summer, come join the smiles and ambiance and create away! Whether you’re an avid builder or brand-new to Legos, you’ll find fun and exciting challenges and explore new construction techniques in this camp. 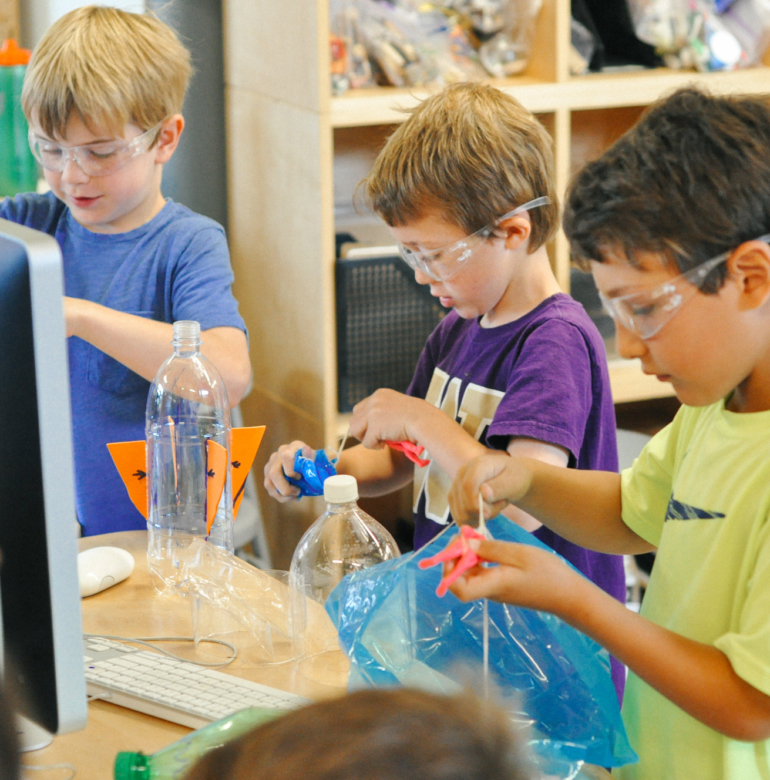 Campers will take on a variety of collaborative and independent activities throughout the week, from feats of physics to beginning programming using WeDo Lego kits. Four Square! Bump! Double Dutch! Let’s spend some concentrated, quality time with playground games loved by all. In addition to tried and true American favorites, we’ll also explore games from around the world. Ever tried your hand at Luta de Galo? How about Oonch Neech? Come learn new games and make fast friends in this energetic camp. Since the earliest days of cinema, moviemakers have employed the use of stop motion and puppetry to tell tales and wow audiences. 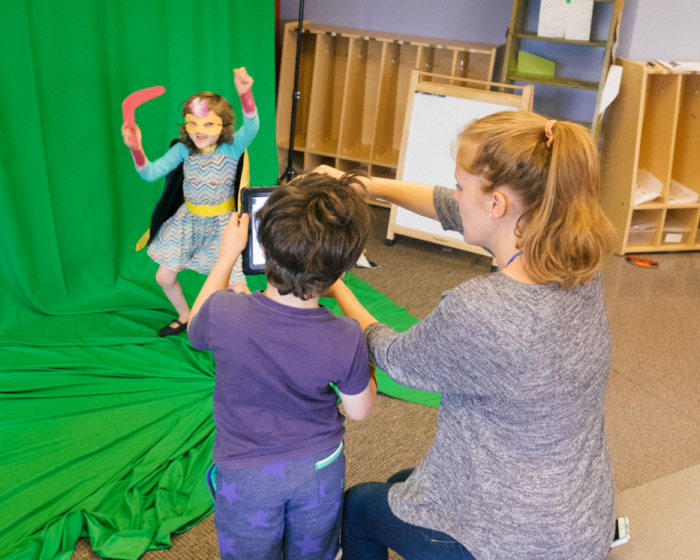 Campers will explore the evolution of stop motion animation from legends Willis O’Brien and Ray Harryhausen to Tim Burton and Wes Anderson in order to develop their own compelling stories using a mixture of methods. Come join Santiago Crosby for a week-long exploration of Capoeira! This Afro-Brazilian dance-like martial art helps build strength, flexibility, balance, and physical discipline. Of course, we’ll also explore the rich musical and cultural traditions of Capoeira. Get ready for a week of movement, music, storytelling, and perhaps even a visit from an area Mestre. What could be more fun than a martial art that calls sparring “play”? Calling all artists, tech wizards, and everyone in between! Digital Art offers you the chance to explore the exciting intersection of art and technology. In collaboration with fellow artists, you’ll take part in developing, planning, shooting, editing and creating different projects. Throughout the week we’ll explore different programs like Adobe Photoshop, Adobe Spark and iMovie to create movie posters, websites, and even a movie trailer. No experience necessary! If you like to roll the dice, spin the wheel, or find the treasure, this camp is for YOU! We will be exploring the world of games from classic board games to role-playing characters. We will dive deep into what makes a game fun, challenging, and timeless. Campers will get a chance to design their own game and create new elements to customize existing ones. Join Casey for a Critical Hit of a good time! This camp is for all ages and it’s all about play! Whether it’s a game of kickball, some high-flying Parkour, a trip to a Seattle parks for a bit of bocce and croquet, or maybe even a rainy-day board game marathon (if we must! ), if you want to spend your summer in a state of laughter and play, Games Games Games is the camp for you. From the traditional to the obscure, these games are sure to be instant-classics throughout the rest of the summer months. So, come join us for some Fun! Fun! Fun! Morning and afternoon EDP is available for all summer campers. Morning EDP begins at 7:00am (camp drop off begins at 8:30am) and afternoon EDP extends the day until 6:00pm (the camp pick up grace period ends at 3:00pm). At EDP, your child will enjoy engaging activities with trained and enthusiastic staff. At afternoon EDP, campers will also be provided with a healthy snack. You may register for full weeks of EDP online (Summer Registration). We ask that you register prior to the Wednesday before each camp begins (i.e. if you are registered for a camp during the week of June 24th – 28th, please register before Wednesday, June 19th). This will allow us to better anticipate staffing and material needs. EDP fees are payable at the time of registration. Register if you plan to pick your child up after 3:00pm more than three times in one week. If you choose not to register your child ahead of time, EDP is also available on a drop-in basis. The fee for drop-in EDP is $16 for AM and $26 for PM. Drop-in payment can be made via check on the day of or billed through our Business Office. By signing up for EDP, you agree to a $1 per minute late charge if your child is picked up after 6:00pm. Resources, tools and programs for educators.